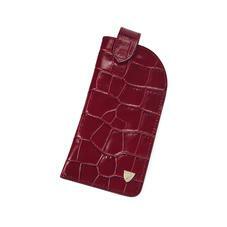 Store your glasses in the stylish surrounds of our Slimline Glasses Case. The butter soft suede lining will safeguard against scratches, while the sleek curved design is a sophisticated fusion of form and functionality. Handmade from the highest quality Italian calf leather, the case is available in a selection of shades and finishes from smooth cognac to deep shine mock croc. The magnet-closure tab ensures your glasses stay safely in place and hand stitched detailing adds a stylish twist.